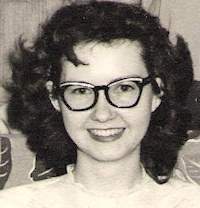 Obituary – Rupp, Mary Lue (Durbin) « Perry High School Alumni Association, Inc.
Mary Lue Rupp, 84, of Perry, Oklahoma, the daughter of George and Ida Christine Loyd Durbin, was born April 14th, 1929 in Henryetta, Oklahoma. She died Saturday, June 29th, 2013 at her home in Perry, Oklahoma. Mary Lue attended school in Perry and Yale, Oklahoma and graduated from Yale High School in 1947. She worked for The Oklahoma State Department of Transportation, Citizen State Bank of Morrison and with her husband Sonny A. H. built a family farm while being a full time homemaker. She had a lifelong love of the Lord and grew up attending the Christian Church. Following her marriage to Sonny A. H. Rupp, on May 12th, 1950, she became an active member of Zion Lutheran Church in Perry, Oklahoma. 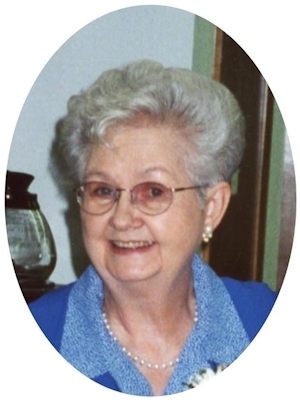 At Zion, she served as President of WELCA for multiple years, as a Sunday School Teacher, Christian Service Committee CoChairman and was an active member of the Luther League and church choir. She served for many years as Noble County Election Precinct worker and as President, Vice President and many supporting roles for The Perry Future Farmers of America Mothers Club, Sumner 4H Club and Morrison and Perry School PTAs. Funeral Services will be held at 2:00 p.m. Wednesday July 3rd, 2013 at the Zion Lutheran Church east of Perry. Pastor Dan Thimell will officiate. Interment will be in Zion Lutheran Cemetery, Perry. Services are under the direction of BrownDugger Funeral Home. Family will receive friends from 6:00 p.m. to 8:00 p.m., Tuesday July 2nd, 2013 at BrownDugger Funeral Home, Perry, Oklahoma. She was preceded in death by her parents and three sisters, Dorothy Johnson, Georgia Mae Mauney and Patricia Faw Faw. In addition to her husband, Sonny A. H., Mary Lue is survived by two daughters, Becky and her husband Larry Krieg of Tulsa, Teresa Snyder of Perry two sons, Randy Rupp and his wife Cindy of Perry, and Russell Rupp and his wife Carlene of Edmond. Eleven grandchildren, Dylan and Tiffany Krieg of Frisco, TX, Brett and Ashley Krieg of Tulsa, Evan Snyder of Atglen, PA, Lacey and Josh Carson of Perry, Lyndee and Byrum Strader of Perry, Jake Rupp, Zack Rupp and Joe Rupp of Perry, Austin Rupp, Parker Rupp and Sunny Fei Rupp of Edmond. Six Great Grandchildren, Gage and Evelyn Krieg of Frisco, TX, Avery and Anna Krieg of Tulsa and Whelan and Wyatt Carson of Perry. Two sisters, Fern Swart, California and Agatha Queen, Broken Arrow, OK also survive. Condolences may be sent to the family using our online guest book at www.brownduggerfuneralhome.com. Memorials may be made to the Zion Lutheran Church building fund in care of Brownn-Dugger Funeral Home, 1010 N. 7th Street, Perry, OK 73077.